Perfect for light commercial and residential use, the HWP-140B and HWP-120 Skid Steer Firewood Processors of Halverson Wood Products in Pine River, MN truly make the job hassle-free. When attached to a skid steer or other equipment, it enables the operator to easily and efficiently perform wood cutting and splitting tasks which normally require 2 to 3 people and a couple of tools - all in the comfort of the cab seat. Read on to learn more about our firewood processing equipment! Logs are picked up with the equipment’s forks and then rolled onto the trough and moved to the table. Once in position, the operator engages the chain swathe, log is cut, and then falls into the splitting trough. 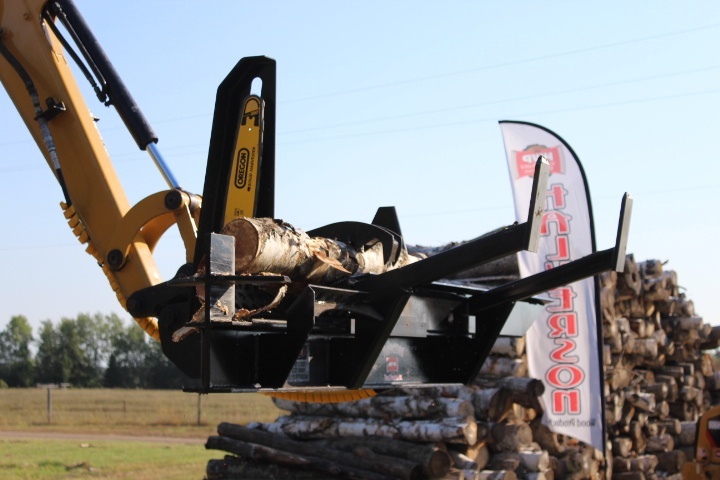 The advancement arm of the firewood processor moves the log to the next cutting position while simultaneously ramming the cut piece into the splitter. Our firewood processing equipment can cut wood into lengths of up to 22 inches and can split the wood into 4 or 6 pieces, depending on the choice of splitting heads.